"Hmmm," I thought carefully eyeing my bookshelf, "favorite book..." My eyes caught the familiar titles that rest quietly beside my bed. I am stopped by familiar and favorite ones, residing near like dear friends. They remind me of moments of intrigue and awe and paradigm shifts. Pages can be so powerful. C.S. Lewis' Narnia series won me over with The Magician's Nephew, the tale of how Narnia all began and Aslan singing creation into being, it remains my favorite in the series to this day. Francine River's Redeeming Love is one of the few books I've read multiple times, always caught up in this adaptation of the Biblical story of Hosea, and Love's relentless pursuit on a young woman searching for truth. Red Moon Rising by Pete Grieg, an intriguing testimony of the power of prayer through churches in England, ignited my own prayer journey. While Always Enough, the story of Heidi and Rolland Baker's journey to bring the love of Jesus to Mozambique, Africa challenged my understanding of a God who still performed miracles like healing the blind and multiplying food. So many books, so many journeys of the heart, mind, spirit, and imagination. My eyes finally stop on one particular treasure. I remember reading this book so clearly. I was in a 15 passenger van with my ministry team from Cairo. We were driving back many hours from a mission trip to New Orleans, Louisiana after helping with Katrina relief. I remember finishing this book and staring out the window for hours just thinking, often holding back tears, so touched by the love of God. The book was drawing me into the truth of God's word - and the truth of my identity in Christ. 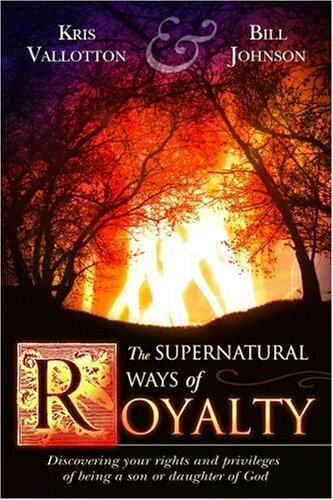 The Supernatural Ways of Royalty by Kris Vallotton talks about our identity as sons and daughters of the Living God. And to this day remains a special book in my library. Everything shifted after I read it. Sometimes a good book is just what you need to remember who you are and Whose you are.